Photo: Joseph Ijams House, ca. 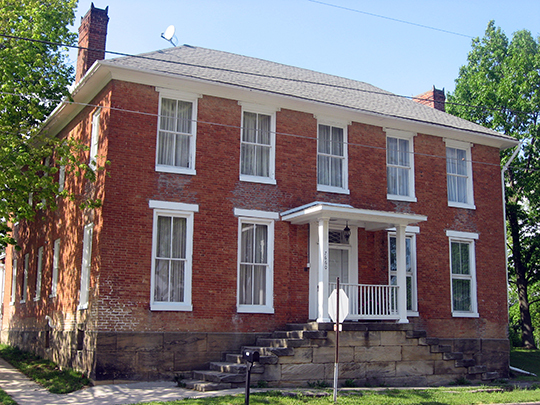 1810, 7660 Main Street, West Rushville, OH. Listed on the National Register of Historic Places in 1983. Photographed by User:Nyttend (own work), 2013, [cc0-by-1.0 (creativecommons.org/publicdomain/zero/1.0/deed.en], via Wikimedia Commons, accessed March, 2014. The Fairfield County Courthouse is located at 210 East Main Street, Lancaster OH 43130; phone: 740-687-7190. Fairfield County was first organized in 1800 by proclamation of Governor St. Clair. At that time it embraced nearly all of the present counties of Licking and Knox, with also portions of Perry, Hocking and Pickaway. Subsequently, as emigration flowed into the country and new counties began to be formed, Fairfield was contracted to its near present outlines, and still later other portions were struck off to adjoining counties. In 1840 Fairfield county consisted of 14 township: Amanda, Berne, Bloom, Clear Creek, Greenfield, Hocking, Liberty, Madison, Perry, Pleasant, Richland, Rush Creek, Violet, and Walnut. In that year the aggregate population of the county was 31,859, or 59 inhabitants per square mile. Fairfield County was so named from the circumstance of so many beautiful champaign fields of land lying within its original boundaries. According to the best information derivable from existing maps of the old surveys, made previous to the beginning of the white settlements off from the Ohio River, the county seems to lie within that tract of country once known as the purchase of the Ohio Land Company; but these maps are believed to be inaccurate, and therefore unreliable. In the year 1797, one Ebeneezer Zane entered into a contract with the government to open a road from Wheeling, Virginia, to Limestone, Kentucky, (now Maysville) over the most eligible route, including also the establishment of three ferries, viz. one over the Muskingum, one over the Scioto, and one over the Ohio. There are different statements as to what kind of road it was supposed to be. By some it is said it was to be a wagon road; others, that his contract embraced nothing more than the blazing of trees, as a guide for travelers. The former is a reasonable conclusion, and is best sustained, as the mere blazes on ranges of trees would not constitute a passable road for travel, and therefore of no use for emigration. The country was at that time an unbroken wilderness of 226 miles, and the undertaking was at once arduous and perilous, as hostile bands of Indians were still more or less roving over the country. He however successfully accomplished the work, and the route was denominated Zane's Trace, and continued to be so called for many years after the State was settled. The route of Zane's Trace lay through where Zanesville now is, and also through Lancaster, crossing the Hocking tow or three hundred yards south of the present Chillicothe Pike, and about one half mile west of the crossing of Main and Broad Streets. The compensation which Mr. Zane received for this service consisted of three several parcels, or tracts of land, patented to him by Congress, and of the dimensions of one mile square each. One of these tracts he located on the Muskingum, where Zanesville stands, and one on the Hocking, embracing the present site of Lancaster.